These photos are provided by my dear clients utilizing only Michele Corley Clinical Skin Care Products (unless noted). The results were achieved by using proper home care product daily, most clients also received regular facials. No equipment beyond a steamer and magnifying lamp were used. These photos are not retouched and are generally taken with cellular phones. Results achieved after a twelve week period of monthly facials utilizing a combination of the resistive and inflammed acne protocol. Home care products recommended for oily/combination acne with underlying congestion and PIH. 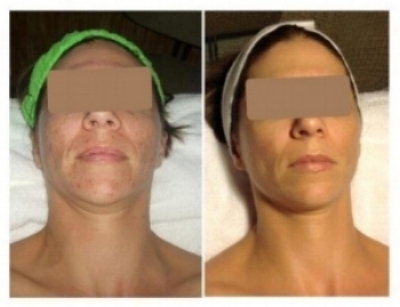 Results achieved after 12 week period of monthly Resistive Acne Facials with modifications as the esthetician saw fit. Results achieved after a 4 week period with one Plump & Hydrate protocol and really good home care. Home care products recommended for extremely dry dehydrated skin. Results achieved after an 8 week period with monthly facials utilizing various aspects from the Plump & Hydrate protocol and the Bright & Tight Vitamin C protocol. Home care products recommended for extremely dry, dehydrated, environmentally damaged skin. Results achieved after a twelve week period of twice monthly facials utilizing a combination of the resistive and inflammed acne protocol. Home care products recommended for oily/combination acne with underlying congestion and PIH. Results were achieved after three weeks with no facials only home care. Home care for sensitive, sensitized skin prone to eczema.